Have you ever wondered how the Music Court comes up with its vast variety of content? Are you saying the blog does not have diverse content? Who are you invisible, detached voice and why must you always negate me! Ok, I’ll stop my idiocy, but it is apt that I get into a disturbed state of mind prior to discussing Pink Floyd … usually. I emphasize usually because today we will be discussing “Bike,” which despite its unique oddness is a childish piece that is purposely humorous because of its psychedelic simplicity. Oh … and the answer to the somewhat haughty initial question is songs in our head and, today, as the title of this post suggests, a shuffled iPod. 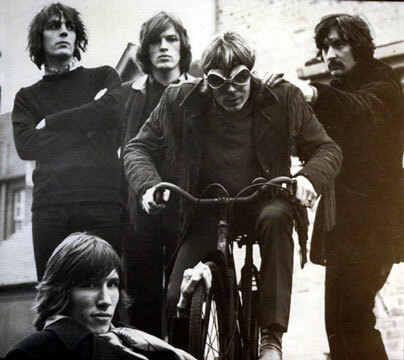 “Bike” was written and recorded during the greatest year of rock ‘n’ roll in the history of ever – 1967. Argue with me all you want, but 1967 has the insuperable crown. It will forever reign as rock ‘n’ roll’s greatest year unless we have another musical renaissance, which doesn’t seem to be coming anytime soon. Syd Barrett, the lead vocalist, guitarist, and primary songwriter of Pink Floyd prior to his forced departure from the band in 1968, may have very well been a tortured soul with mental illness ranging from schizophrenia to a cognitive disorder like autism, but “Bike” does not maintain that disturbed flavor. It is psychedelic. There is no question about that. The song is driven by eccentric percussion transitions (gun shots? ), an oscillating theremin, and an eerie piano that sounds like it is right out of an ironic horror movie. But the tortured Syd Barrett who inspired almost all of Roger Waters’ songwriting for some time (“Brain Damage,” “Wish You Were Here,” “Shine on You Crazy Diamond,”etc.) does not permeate through this piece … which is a purposely childish love song. Less than two minutes of utter goodness. The song was actually written for Barrett’s girlfriend at the time. Yes, “Bike” was written for a girl … the song with the line, “I know a mouse, and he hasn’t got a house. I don’t know why. I call him Gerald. He’s getting rather old, but he’s a good mouse.” What? Can’t you feel the love? Come on! This or “How Deep Is Your Love” by the Bee Gees? Your choice. Barrett wrote this song like a child because it is supposed to be a child’s love song. Think about it. The lyrics are utterly random, but the chorus constantly repeats “You’re the kind of girl that fits in with my world. I’ll give you anything, ev’rything if you want things.” Barrett takes on his inner elementary school child and writes a hilarious love song for a first crush. It’s almost genius if you think about it. By the way, tell me the video above is not hilarious. So … now that you have this love song stuck in your head for the rest of your Saturday, go find a bike and ride it if you’d like, but remember I can’t give it to you because I borrowed it.